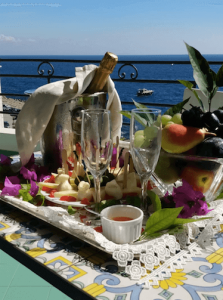 If you are looking for a dreamy atmosphere where you can relax with your partner, why not choose a romantic holiday on the Amalfi Coast, recently risen towards the top among the most romantic destinations ever. Whether you travel on honeymoon or to celebrate a birthday or anniversary or just to have your first holiday together, Amalfi is certainly one of the most picturesque places for a romantic trip, thanks to the breathtaking sunsets, the beauty of its Cathedral and the idyllic bay. From mountains to the sea from food to wine here there is plenty to light up the imagination: the Amalfi Coast has just everything you need to get lost in the paradise of the senses. Long walks at sunset by the sea, romantic dinners with views in the best corners of the Amalfi Coast, private boat rides to enjoy a moment of privacy and intimacy; these are just some of the romantic activities that can be enjoyed in and around Amalfi. And for a classy romantic holiday you also need a hotel suitable for the occasion of a break away from everything and everyone, in the postcard theatre of the Amalfi Coast. Hotel Aurora Amalfi, with romantic rooms overlooking the sea, is the perfect destination for a two-person holiday full of love, thanks to our special package dedicated to lovers, valid from 12 April to 31 May 2019 and from 1 to 27 October, 2019. Take advantage of our offer and enjoy a holiday to remember forever with those you love, in this unique setting! If you are thinking of organising your romantic holiday in Amalfi or you want to surprise your beloved with a gift of love, write to us for more information or book your room now on our official website, where you will find the best online rates on the market!